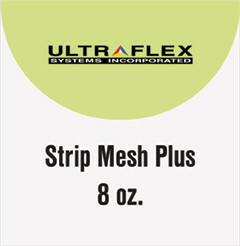 Strip Mesh Plus™ 8 oz. 8 oz. coated polyester scrim mesh banner material that comes with a PVC backing. The backer creates an air-tight print surface to prevent ink spray through and helps feed the material through the printer. The backer may be easily peeled off after printing. This economical light weight material can be printable on one side. Allows 37% air-flow through making it ideal for building, stadium and fence wraps. Compatible with solvent and UV curable printers.